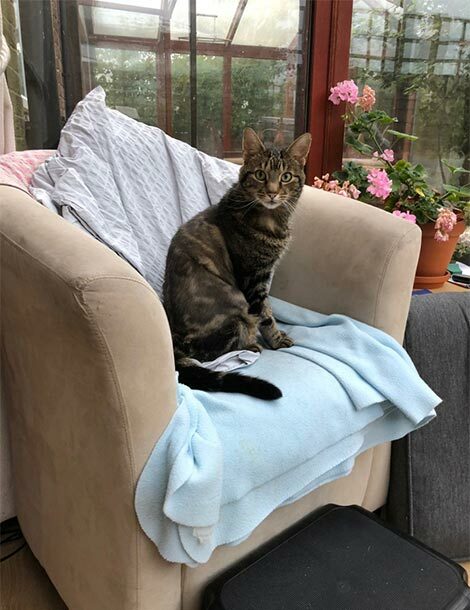 Berkeley is a 14-year old male neutered domestic short hair cat who was referred to the SCVS Soft Tissue Surgery Service for further investigation and treatment of a right thoracic wall mass identified by his owner approximately one month previously while stroking Berkeley. No other health concerns were reported. Examination by the referring veterinary surgeon confirmed a 2-3cm diameter hard mass in the region of the proximal aspect of the 12th right rib. Thoracic radiography performed by the referring veterinary surgeon revealed a poorly-defined proliferative mineral opacity in the region of the proximal aspect of the 12th right rib. 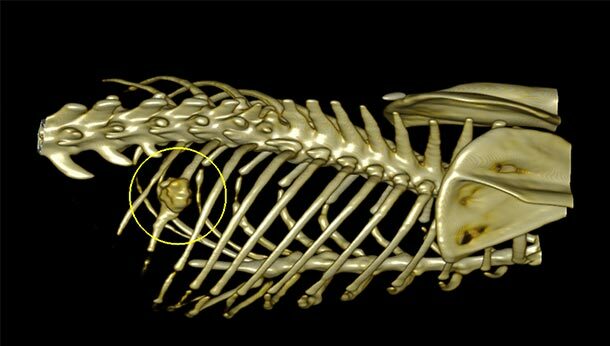 Fine needle aspirates were acquired from the mass by the referring veterinary surgeon and revealed findings consistent with a sarcoma (considered most likely to be either an osteosarcoma or chondrosarcoma). On presentation to SCVS Berkeley was bright and alert. Clinical examination confirmed the presence of the previously identified mass and a novel heart murmur. The remaining clinical examination was unremarkable. Blood sampling was performed for haematology and biochemistry and revealed no significant abnormalities. The SCVS Cardiology Service performed echocardiography which revealed compensated hypertrophic cardiomyopathy (HCM). 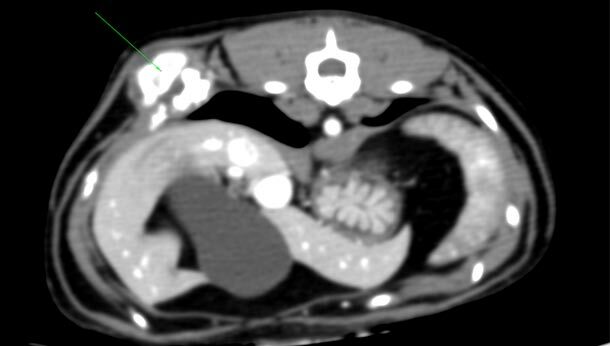 Thoracic computed tomography (CT) was performed under general anaesthesia by the SCVS Diagnostic Imaging Service and revealed a 2cm diameter round mass in the proximal aspect of the 12th right rib with evidence of local destruction and remodelling of the rib (highlighted with a yellow circle and green arrow in images below). The mass mainly extended outwards with minimal bulging in to the pleural cavity and extended cranially infiltrating the intercostal muscles and contacting the 11th rib. Proximally the mass terminated 2cm lateral to the costovertebral joint. Laterally it contacted and displaced the latissimus dorsi muscle with no evidence of invasion. Medially it displaced the lung but with no evidence of pulmonary invasion. There was no evidence of metastasis in the study. Based on these findings excision of the mass with wide margins was recommended and scheduled for the following week. The SCVS Anaesthesia Service was heavily involved in the anaesthetic given the presence of HCM and because use of a ventilator would be required upon penetration of the thoracic cavity during surgery. Epidural anaesthesia was administered prior to surgery. 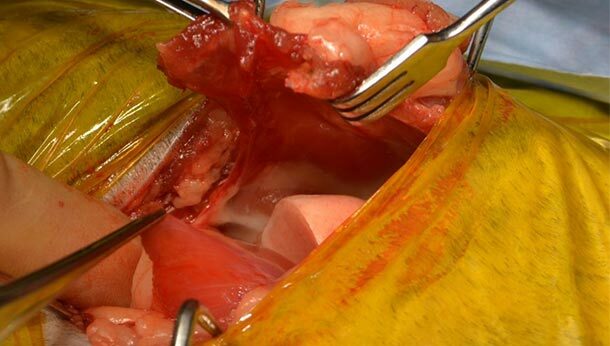 A dorsoventral skin incision was made over the 12th right rib and subcutaneous soft tissues were exposed to immediately cranial to the 11th rib and immediately caudal to the 13th rib. Latissimus dorsi muscle overlying the mass was dissected and was kept attached to the rib mass deep to it (see image 1 below). The 11th, 12th and 13th right costovertebral joints were disarticulated and the 11th, 12th and 13th ribs were transected 2cm distal to the palpable distal margin of the mass. Intercostal soft tissues were dissected cranial to the 11th rib and caudal to the 13th rib and the diaphragm was carefully dissected from its attachment medial to the 12th rib (see image 2 below – the thoracic wall is being elevated with the dissected free edge of the diagphram held in thumb forceps at the bottom of the image; the exposed lung parenchyma is visible protruding from the defect). The resultant window of soft tissue was elevated leaving a 6x6cm defect spanning the thoracic and abdominal walls. 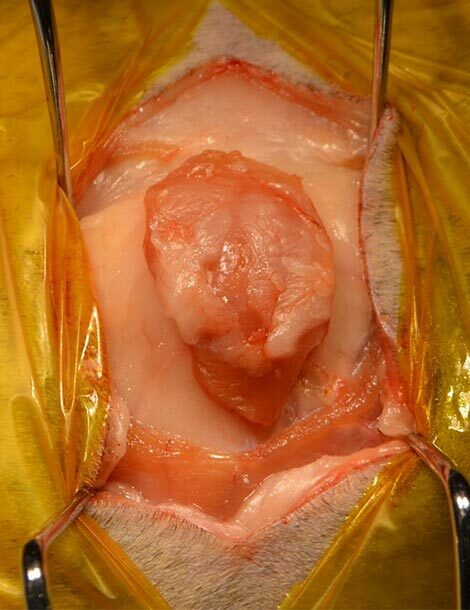 The exposed edge of the diaphragm was advanced and sutured to the psoas musculature dorsally and soft tissues caudal to the 10th right rib (see image 3 below). 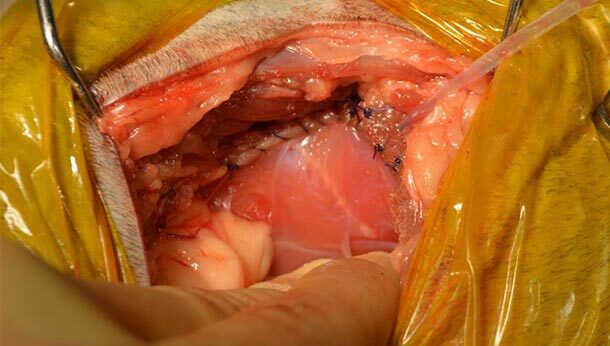 Pneumothorax was drained using a transdiaphragmatic catheter. Soft tissues were closed primarily in layers with intradermal sutures and a Dermabond skin adhesive used to close the skin. The excised tissue was submitted to our on-site laboratory for histological evaluation. Berkeley remained hospitalised for a further two days for intravenous analgesia and close monitoring of respiratory function. No complications were encountered during hospitalisation and he was discharged two days following surgery with instructions to continue crate/room rest for a further two weeks and medical therapy with meloxicam (Metacam oral suspension, dose for 4kg once daily with food) for 10 days. Histological examination of the submitted tissues confirmed complete excision of a chondroblastic osteosarcoma of the 12th right rib. Client telephone and e-mail communication four weeks following surgery reported a return to normal function and satisfactory weight gain following a small amount of weight loss following discharge. Here is a wonderful photo of Berkeley relaxing at home sent to us by his owner four weeks following surgery. Everyone at SCVS is delighted to hear that Berkeley has made such a fantastic recovery.